Son of a Jewish wool merchant. His mother was 20 years younger than his father. He grew up in Vienna where he attended medical school. He did research in the field of physiology under professor Ernst Brücke and studied under Charcot in Paris and Bernheim in Nancy, both psychologists investigating hypnosis. After a while in Berlin he returned to Vienna and married Martha Bernays. He started a practice in neuropsychiatry with his friend Joseph Breuer. His books and lectures made him famous, but also many by many. In 1896 he used the term psychoanalysis for the first time. In 1897 he formulated the Oedipus' complex. In 1902 emperor Francis Joseph appointed him 'profesor extraordinarius'. He published many books and was visited by Jung (1907) and Ferenczi (1908). His psychoanalytic movement was formed by himself and a circle of sympathizers. Freud usually rejected people who didn't agree with him entirely. In 1910 the Psychoanalytical Association was founded in Nuremberg. In 1911 Adler left the movement and in 1913 Jung broke with Freud. In 1915 he was visited by Rilke. In 1923 jaw cancer was diagnosed and he had to give up his habit of smoking cigars. In 1930 he was awarded the Goethe Prize, collected by his daughter Anna in Frankfurt am Main. In 1932 Ferenczi refused to become President of the International Psychoanalytical Association because some of his ideas were not in line with those of Freud. In 1933 he corresponded with Einstein on the topic of war. After the annexation of Austria by Germany in 1938 his house was searched by the Gestapo and he was interrogated. He was allowed to leave for England if he left most of his posessions behind. In June 1938 the family arrived in England. Allthough seriously ill himself, he still treated his patients. In 1938 Dali met him and sketched him as they talked. Dali said he showed the drawings to Freud because it was too obvious that it was the face of a dying man. Freud died in 1939. 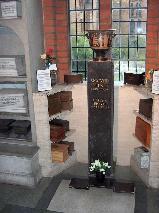 The ashes of Sigmund Freud inside the columbarium of Golders Green Crematorium, London. 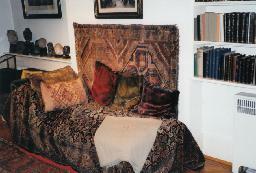 Sigmund Freud's famous analytical couch in his house in London.